Home On-Line Renewals Now Available! We’re pleased to announce our on-line payment system for subscriptions and automatic renewals is now available. This was one of the first things requested by our readers and we did put up a quick-and-dirty system (actually, we put up two) but it was only temporary until we got our web-site going. We’ve tested the on-line payment system (thanks to a friendly neighbor and our Advisory Board) and we’ve improved it based on their comments. 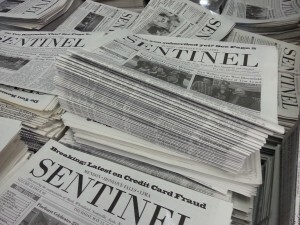 On the top of the page to the right of the “Sentinel” header (the same one that’s at the top of the front page of the newspaper) you’ll see a list of things to do. At the very end on the extreme right (before the magnifying glass) is a link to “Subscribe.” Click that (ignore the drop down menu where the only option is “Log In”). This should bring you to a page that says “Membership Checkout.” Under “Membership Level” it should say “You have selected the Subscriber membership level.” Underneath “The price of membership is $40.00 per Year” in smaller print is “Do you have a discount code? Click here to enter your discount code” Go ahead and click there. A Discount Code window pops up. Enter the discount code “ILikeYou” (without the quotes but with the upper and lower case letters as written). IMPORTANT: IF YOU DON’T ENTER THE DISCOUNT CODE YOU WILL NOT BE ELIGIBLE FOR THE $10 SAVINGS on next year’s automatic renewal. Limited Time Offer Extended through Monday, November 7, 2016! Hit “Apply” and the sentence “The price for membership is $40.00 per Year. After your initial payment, your first payment will cost $30.00.Membership expires after 1 Year.” should appear. This means you’ll get a $10 discount when you automatically renew next year. Click “Submit and Check Out.” The word “Processing” will appear and then you will get a new window that says “Membership Confirmation.” This is your invoice and receipt. You can simply click “News” at the top of the page and it will return you to the newspaper.